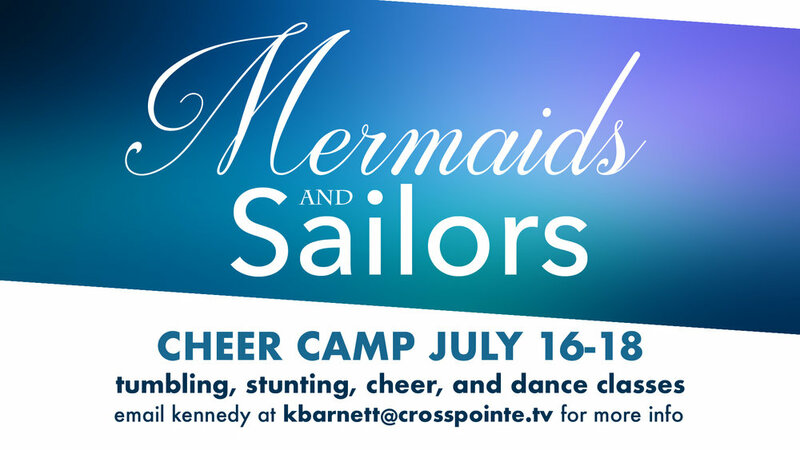 CrossPointe Church will be hosting a cheer camp this summer for children ages 5-14. There will be tumbling, stunting, cheer, and dance classes available. There will be two different sessions each day. Sessions will be 8-11 AM for ages 5-9 and 1-5 PM for ages 10-14. There will be games as well as fun learning and team bonding activities. There will be a group/team performance on the last day of camp for parents to come and see. Come and receive expert coaching and skills development from experienced cheer coaches and accredited cheer alumni. To register or for more information please come to our table in the Great Hall this Sunday, July 1 or Sunday, July 8 or July 15. You may also email Kennedy at kbarnett@crosspointe.tv to register or for more information. The full camp price is $50. This covers three days of camp and a t-shirt. T-shirts are pre-ordered, so if you register on the day of camp, you may not get your t-shirt in time for the performance on the last day. If you attend the second two days, the price will be $40 without the t-shirt. If you only attend the last day, the price will be $30 without the t-shirt. If you would then like to buy a t-shirt, it will cost $12. Small snacks; such as goldfish, fruit snacks, and chips; will be provided during a snack time each day. Water will also be provided. If you would like any other snacks, you may provide your own. Check in will be located in the Crosspointe Church gymnasium. This is where the camp rally, dance and cheer classes, snack time, group game, group jumps, and closing rally will take place. Tumbling classes and stunt classes will take place on the Crosspointe Church athletic fields. If there is rain, all classes will be held in the gymnasium. The south parking lot will be open for parents/guardians. Parents/guardians are required to sign a waiver form in order for their child to take part in camp activities. The first two days will be filled with learning opportunities and preparation for a group performance on the last day. There will be group games as well as class time games that teach communication, teamwork, and life lessons. There will be a dance and a cheer that will be taught to perform on the last day of camp. Middle school and elementary school will not be learning the same dances or cheers. Once you register, if you would like a video sent to you on the first day of camp with the cheers and dances, we will email them to you so your child can have more practice. On the last day, there will be an award ceremony after each group has performed their cheer and dance. Parents/guardians are welcome to stay and watch their child at camp. There will be places to sit indoors, but you will have to provide your own chair for outdoor classes.